The RP Photonics Buyer's Guide contains 2 suppliers for optical clocks. An optical clock is a clock the output of which is derived from an optical frequency standard. As explained in the article on optical frequency standards, such a reference is based on atoms or ions which are kept in an optical trap and subject to laser cooling in order to suppress Doppler broadening. Their transition frequency is probed with a frequency-stabilized laser and related to lower (microwave) frequencies via an optical clockwork. An optical clock can offer an extremely high frequency precision and stability, exceeding the performance of the best cesium atomic clocks. 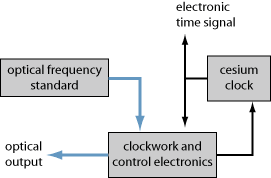 In the early years of optical clocks, a severe challenge was to relate the stable optical frequency to a microwave frequency standard such as a cesium atomic clock: the required optical clockworks, at that time realized as frequency chains, were very difficult to make, and were applicable only to certain isolated optical frequencies. Recently, however, very much simpler and much more versatile while equally precise optical clockworks have been realized on the basis of frequency combs from femtosecond mode-locked lasers. Figure 1: Schematic setup of an optical clock. A time signal is generated by a cesium clock. An optical frequency standard is used for reducing the long-term drift of the cesium clock. The frequency comparison is done using an optical clockwork. That clockwork may also provide an optical output, e.g. in the form of a frequency comb, allowing frequency comparison with other optical standards. There are certain atoms and ions with extremely well-defined clock transitions (forbidden transitions) which promise higher accuracy and stability than the best microwave atomic clocks. The anticipated (but not yet demonstrated) relative frequency uncertainty of atomic optical clocks using electronic transitions is of the order of 10−18 for long enough averaging times (possibly a few days). It may even become possible to use certain low-energy nuclear transitions in order to get to 10−19 level . The high optical frequencies themselves are of high importance because these allow precise clock comparisons within much shorter times. For example, a 10−15 precision can be achieved in a few seconds if the compared frequencies are in the optical range (hundreds of terahertz), whereas the order of a full day would be required with microwave clocks. Optical signals can be easily transported over long distances using optical fibers. It is even possible to obtain a very precise time comparison between different clocks at different positions, using optical-frequency transfer over fiber-optic links . Compared with fibers, microwave cables are more expensive and have much higher losses, and are therefore technically much more limited. Therefore, it is to be expected that in the not too far future the cesium clock as the fundamental timing reference will be replaced with an optical clock, although it is so far not clear which type of optical clock would be used as such a standard. A lattice clock  appears to be a good candidate, but the best choice of a particular clock atom is not obvious. The definition of the second will then be changed to refer to an optical frequency, rather than to a microwave frequency. However, even after that profound change, cesium clocks (and other non-optical atomic clocks, such as rubidium clocks) will continue to play an important role in technological applications as they can be simpler and more compact than optical clocks. TOPTICA offers laser sources for various applications and optical metrology, including time and frequency measurements.